MANILA (UPDATE) - Cagayan and northern Isabela were placed under the second highest tropical cyclone warning signal Friday as Typhoon Ompong (international name: Mangkhut) approached for landfall. State weather bureau PAGASA placed the two areas under Tropical Cyclone Warning Signal No. 4 as winds of 171 to 220 kilometers per hour (kph) were expected to be felt within the next 12 hours. 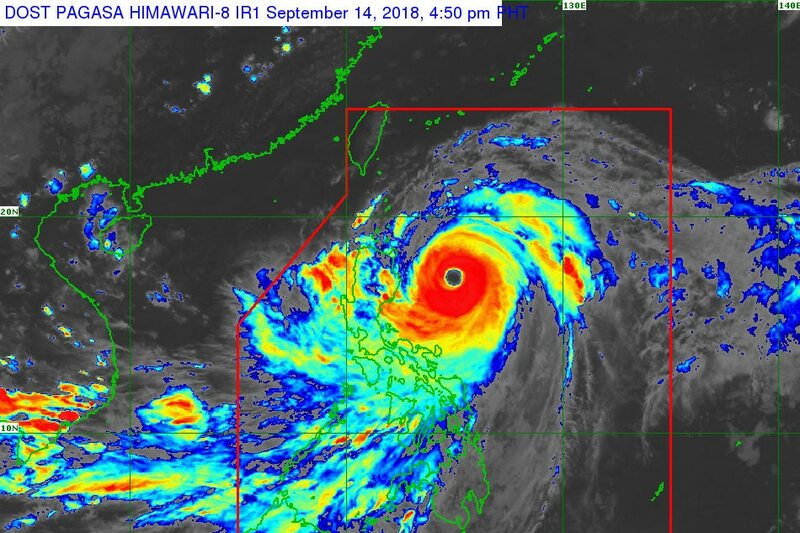 The typhoon is likely to make landfall around 4 a.m. Saturday, PAGASA weather specialist Gener Quitlong and ABS-CBN resident weather specialist Nilo Millanes said. Ompong, the strongest typhoon to hit the Philippines this year, slightly gained speed and is now moving northwest at 30 kph from 25 kph Friday afternoon, PAGASA said. Storm surges of up to 6 meters above mean sea level are possible in coastal areas in Cagayan, Isabela and Ilocos region where the storm will hit land first, PAGASA said. Meanwhile, scattered rainshowers will be experienced over the Visayas, MIMAROPA, northern Mindanao, Zamboanga peninsula and the CARAGA region due to the trough of Typhoon Ompong and the southwest monsoon. Government has initiated urgent preparations in areas on the path of the storm, evacuating thousands, readying relief supplies, and prompting farmers to harvest their crops ahead of Ompong's onslaught. Ompong is expected to exit the Philippine area of responsibility by Sunday morning.